Thank you for all the wonderful comments, @rosemow. I was thinking of putting the snake in the office, but it really fit well with theme I had going in that bedroom. Thank you, @ciane. I really like that brick pattern. For such a tiny, little space, the office took me a long time to pick out what I wanted to do and then I recolored everything twice. Your Pretty in Pastels is spot on dear! Very lovely build! 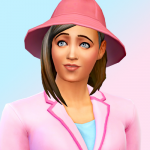 I'm rather late managing to come by, but I wanted to tell you that every time I see your new Pretty in Pastels on the exchange (I've been haunting it due to the gift exchange), it strikes me as so pretty. It has lovely architecture, and I do love those pastels. You have a lot of interesting MOO'd areas that I enjoyed, with some ideas that never occurred to me to try. There's certainly lots to love, and I think my favorite spots are the peachy bedroom, the kids' study, and that darling little planter bowl room. Without a shadow of a doubt, this home did come with the most moo ideas I've ever done. I'm not used to doing such large homes, so I did a lot of experimenting. I had a lot of fun with it. 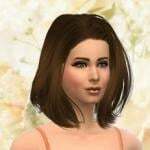 Mostly, I tried to use ideas I might find in a magazine and tried to make my own sim version of them. I try to do the least amount with actual interactive objects, so that I don't get too much lag or annoyed sims stomping their feet. Out of all of them, there's only two mirrors and a bookcase that are not accessible. I'm so happy I've gotten some good reviews for that kids study. It's not the biggest study ever, but I spent hours and hours trying to perfect it and then I ended up recoloring the whole thing to make it go better with the theme of the house. Hee! I love the peachy bedroom, too. It's one of my favorite rooms because of the built ins. I think the planter bowl room was the easiest to create. I almost went a wee bit more farmhouse in there, but switched the red plaid (which I liked a lot, a lot) out with the purple color it's got in the upload (again, to go better with the theme). 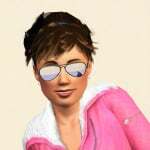 I then had my sim go in and plant several things just to get things started. I knew I'd need it for my sims in the winter months. Aw Pretty in Pastels has such a darling exterior and so much detail throughout. Glad you had such fun creating this build. Well done! Well, I'm a bit behind! Just adore the entry color with the cubbies and that butterfly pattern fit perfect on the handbag. I love the peach master with the little office area and all the little Moo tricks by the bed. Very creative and pretty lot! @romagi1, thanks for stopping by! That's one of my favorite rooms. There's still so much in the game I have not even tried yet, largely in part because I do enjoy creating more than I enjoy actual gameplay. I've barely explored Bridgeport, for instance. One of it's new buildings and rabbit holes was 'Plumbob Pictures Backlot', a terribly dark and grungy studio for television and film, which is only perfect for that particular world. In any other world, it's out of place. So, I had an idea to make my own rabbit hole lot and hide it in the basement using content that I just purchased from Roaring Heights. Plumbob Studios is a brand new shell lot that I started working on, just a couple days ago. 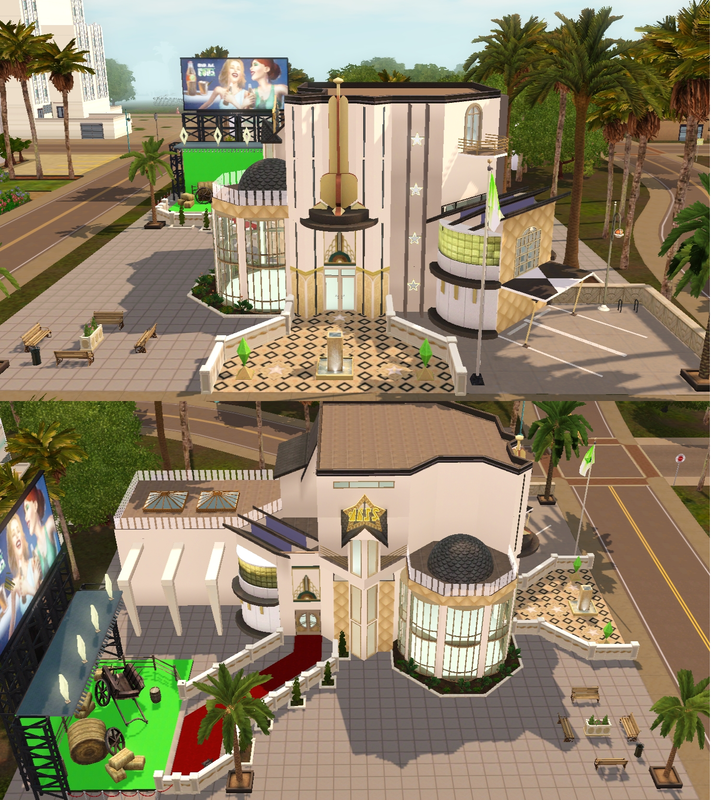 Using several pieces from Roaring Heights, it now has the glitz and glam your celebrity wannabe sims are craving. Adoring fans can watch their favorite stars strut their stuff down the restricted access red carpet from the ropes and watch them film a few scenes from their latest blockbuster film! 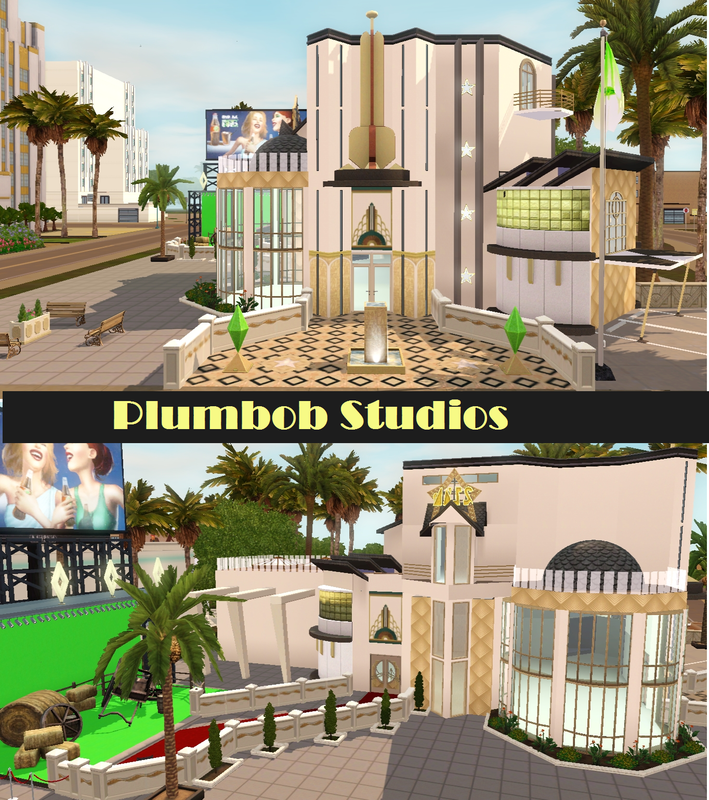 Plumbob Studios looks very glamourous and elegant! 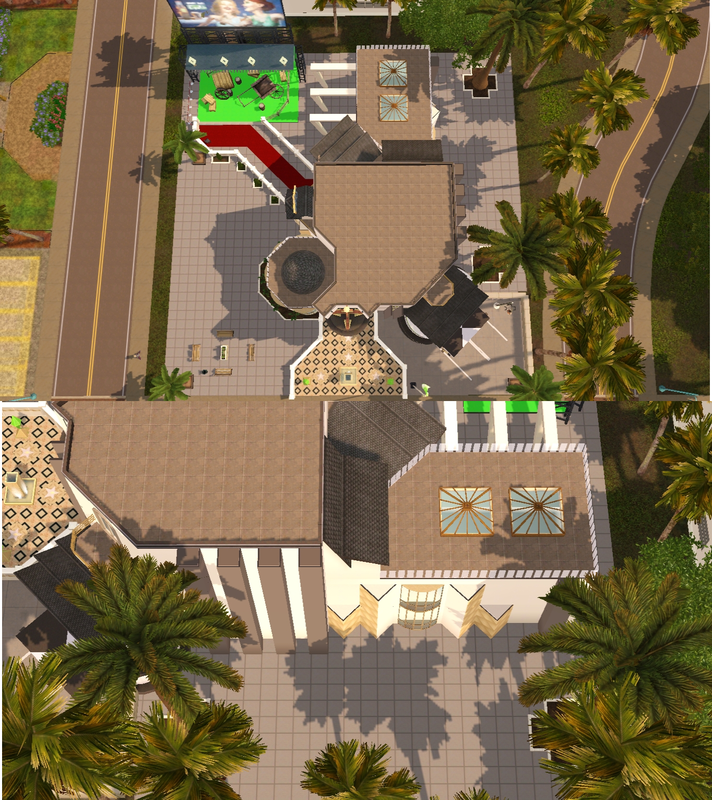 It looks very nice the way that you have used the items that came with Roaring Heights! 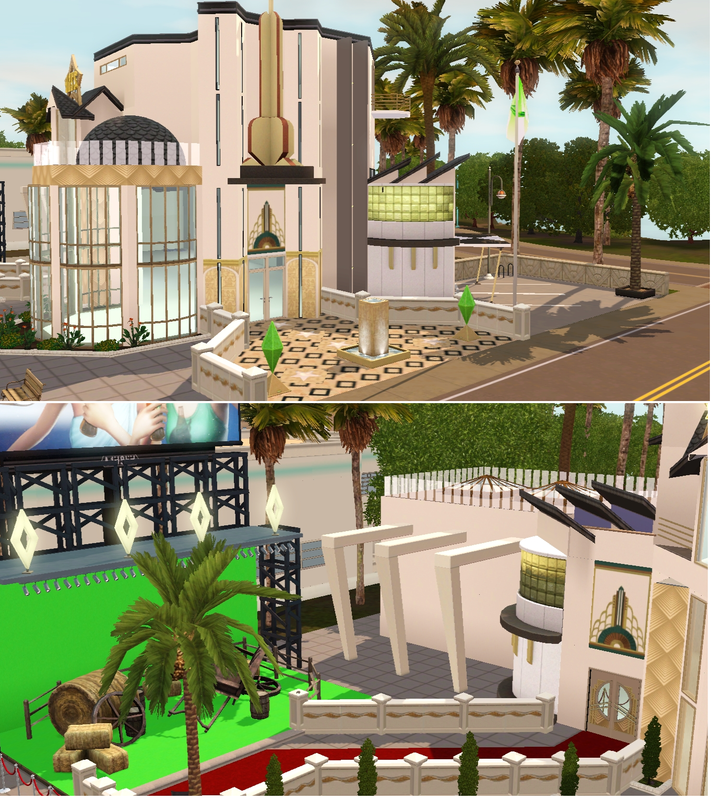 The Art Deco style looks great! The diamond patterned flooring, large plumbobs and water fountain feature in the entrance porch are very nice! Very nice restricted red carpet entrance area for movie stars! The skylight roofing is a special touch in the build. The vertical row of stars on the wall, and the large star over the window look very nice. What a great idea! Very glamours place to work now and I love that you did the green screen! Got ya rec'd! Thank you, @rosemow and @romagi1. Your Plumbob Studios is wonderful dear! You linked me to your thread on my thread, even though I was specifically here for one lot, I was nosy and went looking through the rest, you are a really great builder all of these are beautiful! I love your studio lot.Thanks for linking this thread.I bookmarked and Favorited quite a bit here. I hope you find the links I listed helpful. Unfortunately, it is pretty hard to find lots with the showtime stage. I think of about 400 favorites, those are the only ones I have with them. Very original! I love the Hollywood glam! Wow! Your Pretty in Pastels is AMAZING! I love your creative use of clutter and MOO. It has inspired me to build again! It's been a little while since I've played. I thought about making a farmhouse the other day, after getting some inspiration from Pinterest. 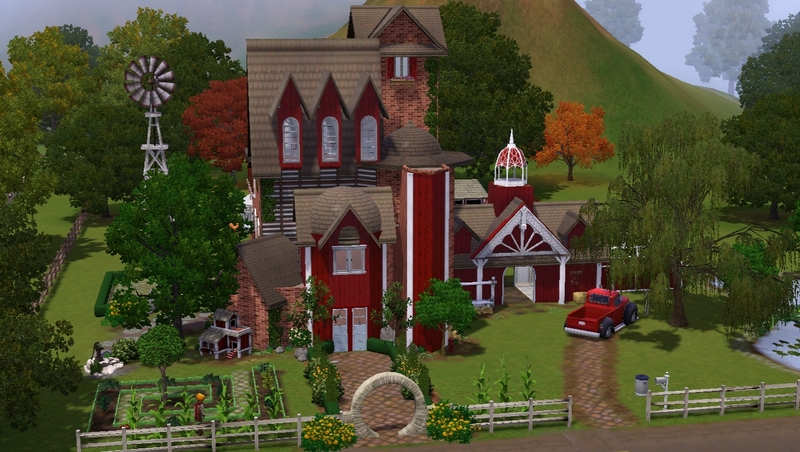 Today, I went into game and was just messing around, hoping to create something that looks like a farmhouse. I usually begin with said ideas on pinterest, sometimes copying the look I see, but I always scrap it in the end. 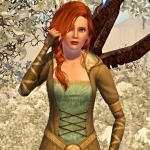 I'm a much better builder and creative simmer when I just begin from scratch and make it up as I go. I did, however, incorporate a look I saw for the garage, which I'm happy about. Right now, I'm just working on the outside. I'm thinking about what I could put on the right. I put the milkin' it dairy corral in the front corner of the lot, where it fit well enough, but I feel like horses need more space. That's why I'm also only thinking about adding a pond and considering expanding the lot to 50X50 (I'm working with 30X40 for now). Well, please let me know what you think so far. I'm down for any suggestions on what to do with the right-hand side. 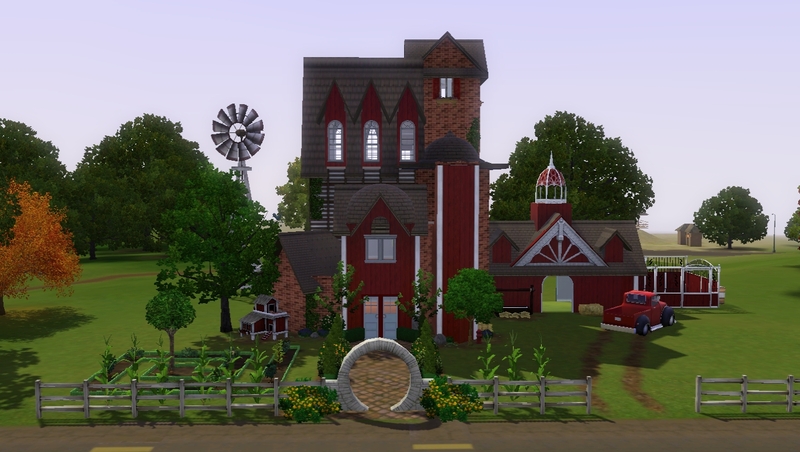 The farmhouse build is looking very great! Very nice exterior of the farmhouse building ! The outdoors areas are looking great! The front left corner garden area is very nice! For the right hand side, you could perhaps add a tree and seating under it ? Or playground equipment for kids? Perhaps you could add a fountain there? @rosemow, oh that's right! I had been thinking of putting a fountain somewhere. Thanks for reminding me! Hmm, if I decide to put in some playground equipment, I would need to expand the lot. The house isn't as big as it looks. It has a funky look to it, at least till I work out a floor plan, but that will be for another day. Very interesting. I like it! Okay, so I expanded the lot to 50x50, which leaves me with an enormous amount of space to work with. The back of the house is now a lot larger, so I should be able go make more than one bedroom, now. I'll have to get more creative to fill this yard, but I've got some ideas. I added quite a bit that you couldn't see in my first picture. I think I'm pretty much done with the front of the lot. I just haven't added any lighting yet. The back yard is where I'll put the dairy corral.